HCM CITY — Investment in tourism infrastructure, services and human resource training is needed to draw more tourists to Cái Răng floating market in the Cửu Long (Mekong) Delta city of Cần Thơ, experts have said. The Cái Răng floating market reflects the unique cultural values and lifestyle of the Mekong Delta, said Vương Công Khanh, vice chairman of the city’s People’s Committee. It has long become a popular tourist destination in the Mekong Delta. In 2016, the Ministry of Culture, Sports and Tourism recognised Cái Răng market as a national intangible cultural heritage. This recognition was an advantage for Cần Thơ tourism, but the city has yet to realise its potential due to low investment in tourism infrastructure, Khanh said at a workshop held on Sunday in Cần Thơ City. Participants said that the lack of docking berths, restaurants and clean public toilets in locations popular with tourists hindered the attraction of tourists to the market. The floating market is not well organised or managed, resulting in overpriced and poor quality goods as well as damage to the environment. Nguyễn Thị Mỹ, head of Cần Thơ City’s heritage management committee, said that city authorities should better manage the price lists of goods and services at the market. An on-site tourism workforce should also be professionally trained, especially in foreign languages, experts said. The workshop was part of the activities of the annual Cái Răng Floating Market Culture and Tourism Festival that wrapped up on Monday. The three-day event honoured the cultural values of the floating market and promoted the image of the tourist site to local and foreign travellers. 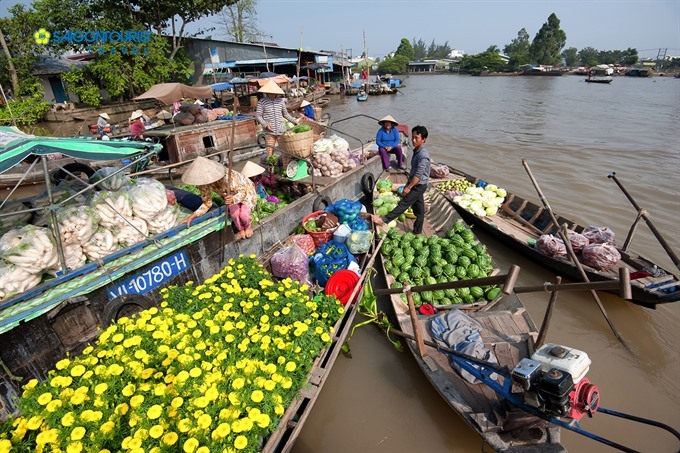 The Cái Răng floating market, located about 6km from the centre of Cần Thơ City, is one of the three biggest floating markets in the Mekong Delta.